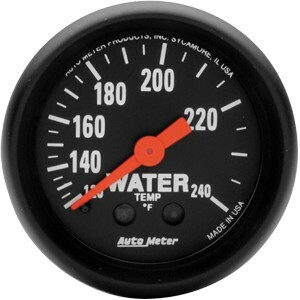 Autometer Z-Series 120-240° Water Temperature Gauge Only $84.00. Autometer Z-Series Water Temperature Gauge Kit. High performance movements and understated good looks make this series a perfect choice for low-key instrumentation. These instruments are illuminated using perimeter incandescent lighting. Red and green bulb covers are included to change backlight color. Additional bulb cover and LED replacement bulb options available separately.